Tunisia (Arabic: تونس, Berber: ), officially the Tunisian Republic (الجمهورية التونسية), is a country situated on the Mediterranean coast of North Africa. It is the northernmost African country and the smallest of the nations situated along the Atlas mountain range, bordering Algeria to the west and Libya to the south east. Around forty percent of the country is composed of the Sahara desert, with much of the remainder consisting of particularly fertile soil, and a 1300-km coastline. Both played a prominent role in ancient times, first with the famous Phoenician city of Carthage, and later, as the Africa Province, which became known as the bread basket of the Roman Empire. It is thought that the name Tunis (Arabic for both the nation and capital city) originated from Berber, meaning either a geographical promontory, or, "to spend the night." 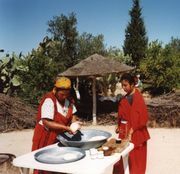 At the beginning of recorded history, Tunisia was inhabited by Berber tribes. Its coast was settled by Phoenicians starting as early as the 10th century BC. In the 6th century BC, Carthage rose to power and eventually became the dominant power in the Mediterranean after a series of wars with Greece. Carthage was founded in the 8th Century B.C. by settlers from Tyre, now in modern day Lebanon, and the settlers of Carthage brought their culture and religion from the Phoenician and Canaanite legacy. Legend says that Queen Dido founded the city, as retold in the Roman Epic Aeneid. The people of Carthage worshiped a pantheon of Middle Eastern Gods including Baal and Tanit. Tanit's symbol, a simple female figure with extended arms and long dress, is a popular icon found in ancient sites. The founders of Carthage also established a Tophet which was altered in Roman times. Though the Romans referred to the new empire growing in the city of Carthage as Punic or Phoenician the empire built around Carthage was a distinct independent political entity from the other Phoenician settlements in the Western Mediterranean. During a series of wars with Rome, a Carthaginian invasion of Italy led by Hannibal during the Second Punic War nearly crippled the rise of the Roman Empire. Carthage was eventually conquered by Rome in the 2nd century BC, a turning point which led to ancient Mediterranean civilization having been influenced mainly by European instead of African cultures. After the Roman conquest, the region became one of the granaries of Rome. It was conquered by the Vandals in the 5th century AD and reconquered by the commander Belisarius in the 6th century during the rule of Byzantine emperor Justinian. In the 7th century the region was conquered by Arab Muslims, who founded the city of Kairouan. Successive Muslim dynasties ruled, interrupted by Berber rebellions. The reigns of the Aghlabids (9th century) and of the Zirids (from 972), Berber followers of the Fatimids, were especially prosperous. When the Zirids angered the Fatimids in Cairo ( 1050), the latter sent in the Banu Hilal tribe to ravage Tunisia. The coasts were held briefly by the Normans of Sicily in the 12th century. In 1159, Tunisia was conquered by the Almohad caliphs. They were succeeded by the Berber Hafsids (c. 1230– 1574), under whom Tunisia prospered. In the late 16th Century the coast became a pirate stronghold (see: Barbary States). In the last years of the Hafsids, Spain seized many of the coastal cities, but these were recovered by the Ottoman Empire. Under its Turkish governors, the Beys, Tunisia attained virtual independence. The Hussein dynasty of Beys, established in 1705, lasted until 1957. In the mid-1800's, Tunisia's government under the rule of the Bey severely compromised its legitimacy by making several controversial financial decisions that led to its downfall. France had been planning to take control of Tunisia when the Bey first borrowed large sums of money in an attempt to Westernise. This failing state facilitated the Algerian raids that occurred thereafter. The weakened Bey was powerless against these raids and unable to resist European colonization. In 1878, a secret deal was made between the United Kingdom and France that decided the fate of the African country. Provided that the French accepted British control of Cyprus, recently given to the United Kingdom, the British would in turn accept French control of Tunisia. This satisfied the French and led to their assumption of control in 1880. Tunisia was formally made a French protectorate on May 12, 1881. Tunisia gained independence from France in 1956. The Bey reclaimed power, but was soon deposed by French-educated Habib Bourguiba in 1957. He was quickly selected to be the Republic's first president and served through 1987. Tunisia was the scene of the first major joint operations between the United States and British allies in World War II during 1942– 1943. The main body of the British army, advancing from their victory in Battle of el-Alamein under the command of British Field Marshal Montgomery, pushed in to Tunisia from the south whereas the US and other allies, following their invasions of Algeria and Morocco in Operation Torch, came from the west. With Germany engaged in the battle of Stalingrad, it is easy to dismiss the battle for Tunisia as a minor event, but in fact it had significance for the rest of the war. General Erwin Rommel, commander of Axis forces in North Africa, had hoped to inflict a similar defeat on the allies in Tunisia as the German forces had in the Battle of France in 1940. Until the battle for Tunisia, the inexperienced allied forces had generally been unable to withstand quick German blitzkriegs or properly coordinate their operations, therefore the battle for Tunisia was a major test of the allies. If they were going to defeat Germany they were going to have to fight together, and stand up to the inevitable setbacks that the excellent German forces would inflict. On February 19, 1943, General Rommel launched an attack on the American forces in the Kasserine Pass region of Western Tunisia, hoping to inflict the kind of alliance and morale shattering defeat the Germans had won in Poland and France. The initial results were a disaster for the United States; to this day the area around the Kasserine Pass is the site of many US war graves from that time. However, the American forces were ultimately able to stop their retreat, having learned a critical lesson in tank warfare. On March 20, 1943, the Allies broke through the German Mareth line and subsequently linked up on April 8, 1943. Thus, the alliance of the United States, the United Kingdom, the Free French, and Polish as well as other forces were able to win a major battle as an allied army. Tunisia is a republic with a strong presidential system dominated by a single political party. President Zine El Abidine Ben Ali has been in office since 1987 when he deposed Habib Bourguiba, who had been President since Tunisia's independence from France in 1956. The constitution has been changed twice to allow him to remain in power: initially from two to three terms, and then from three to five. The ruling party, the Democratic Constitutional Rally (RCD), was the sole legal party for 25 years — when it was known as the Socialist Destourian Party (PSD) — and still dominates political life. The President is elected to 5-year terms — with virtually no opposition — and appoints a Prime Minister and cabinet, who play a strong role in the execution of policy. Regional governors and local administrators also are appointed by the central government; largely consultative mayors and municipal councils are elected. There is a unicameral legislative body, the Chamber of Deputies, which has 182 seats, 20% of which are reserved for the opposition parties. It plays a growing role as an arena for debate on national policy but never originates legislation, and virtually always passes bills presented by the executive with only one minor change. The judiciary is nominally independent but responds to executive direction especially in political cases. The military is professional and does not play a role in politics. There are currently six legal opposition parties having their own Journals. Tunisia is noteworthy for its lack of public political discourse. Tunisia's precise political situation is hard to determine due to an effective level of silence maintained by the government and a lack of transparency. There is strong evidence that dissidents are routinely arrested, for crimes as minor as looking at banned web sites. The growth of the internet has been a major issue for Tunisia, with European tourists and ISPs so close by. Tunisia allows only censored internet access. This censorship bars all materials deemed pornographic, and any chat group references critical of the government. It seems unlikely that the oppression brought to bear is restricted only to the internet. Tunisians feels very insecure when talking about politics and this could be explained by the fact that the Tunisian authority imposes big restrictions, despite official speeches, on the freedom of speech and on human rights. The control of the internet is the most immediately apparent sign of the pervasive structure of state control which has managed to shroud itself with a Western-friendly face. For instance, the website of [www.alrabiya.net] channel is officially censored and inaccessible to all Tunisians from any computer in Tunisia. Both the European Union and the United states of America, and despite there economic weight to impose the respect of human rights in Tunisia, turns the blind eye to all human rights abuses in Tunisia. 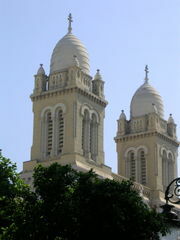 Many Tunisian citizens believe that there is a kind of conspiracy between their government and these superpowers in this matter, and they even explain it by the fact that the Tunisian government has held power not because of the support of its citizens but because it safeguards the economic interests of many Western corporation located in Tunisia. Tunisia is also one of the few Muslim countries (like Azerbaijan and Turkey), where hijabs are prohibited in government buildings. The government in power forces women wearing Hijab either to quit their jobs or to drop out of school if they insist on wearing it. They force women with veils to sign a document in which they admit to having committed a crime punishable by law and, in case of recidivism, put them in jail. The Tunisian authorities foist propaganda on all state and private media against women who insist on keeping their veils despite all threats. Underground opposition from Islamic Fundamentalists have an obvious but shadowy existence in the nation. Under former Habib Bourguiba, Islamic Fundamentalists were allowed to serve as a counter to more left wing movements. In 1987, Zine al-Abidine Ben Ali took power in a bloodless coup. Ben Ali has followed an aggressive policy regarding the Fundamentalists, but the extent of any government success is difficult to judge in a nation where so much is secret. While Tunisia has a repressive political system, standards of living are among the best in the developing world. Tunisia remains an autocratic regime, but one free of many of the problems of starvation, homelessness, and disease seen in much of Africa and Asia. Tunisia is in northern Africa, between the Mediterranean Sea and the Sahara Desert and bordered by Algeria in the west and Libya in the south-east. Much of the land is semi-arid and desert. There are mountains in the north. The climate is temperate in the north, with mild, rainy winters and hot, dry summers. The Sahara desert is in the south. Tunisia has a diverse economy, with important agricultural, mining, energy, tourism, petroleum, and manufacturing sectors. Governmental control of economic affairs, whilst still heavy, has gradually lessened over the past decade with increasing privatization, simplification of the tax structure, and a prudent approach to debt. Real growth averaged 5.0% in the 1990s, and inflation is slowing. Increased trade and tourism have been key elements in this steady economic growth. Tunisia's association agreement with the European Union (EU) entered into force on March 1, 1998, the first such accord between the EU and Mediterranean countries to be activated. Under the agreement Tunisia will gradually remove barriers to trade with the EU over the next decade. Broader privatization, further liberalization of the investment code to increase foreign investment, and improvements in government efficiency are among the challenges for the future. While the vast majority of modern Tunisians identify themselves as Arabs, they are mainly the descendants of indigenous Berbers: less than 20% of their genetic material comes from the Middle East . Numerous civilizations have invaded, migrated to, and been assimilated into the population over the millennia. Significant influxes of population have come through conquest by the Phoenicians, the Romans, the Vandals coming from Germany, the Arabs, the Ottomans, and the French. Many Spanish Moors and Jews also arrived at the end of the 15th century. Nearly all Tunisians (99% of the population) are Muslim. There has been a Jewish population on the southern island of Djerba for 2500 years, and though considerably diminished, there remains a small Jewish population in Tunis which is descended from those who fled Spain in the late 15th century. There is a small indigenous Christian population. Small nomadic indigenous minorities have been mostly assimilated into the larger population.